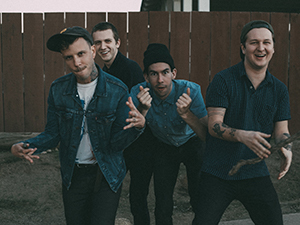 Beginning as a way to kill boredom in the summer of 2012, following their senior year of high school, The Frights began writing surf punk and recording simple, catchy songs in their free time. A short time after, each of the original members parted ways for college and work, but soon got back together just weeks later with a new sound and new influence. They signed to Postmark Records after their first show, where they released their first 5 records including their debut full length self titled album. They then moved to Dangerbird Records for their sophomore LP release, You Are Going To Hate This. The Frights sound like something you would hear at a 1950’s Underwater Halloween party. With Mikey Carnevale (Lead vocals, Guitar), Richard Dotson (Bass, Vocals), and Marc Finn (Drums), The Frights are a surf punk band with a special hint of dirty doo wop.